Janmastami, 1972. 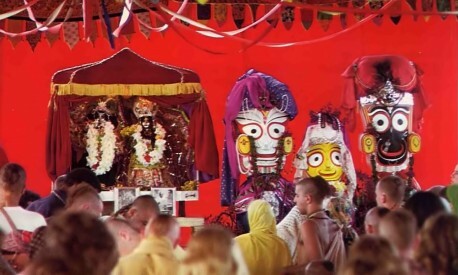 Devotees of the Lord take advantage of His appearance day to make a holy pilgrimage to New Vrndavana where Their Lordships Sri Sri Radha Krishna and Jagannatha, Subhadra and Balarama–all forms of Krishna–preside. THIS YEAR, three auspicious days of special celebration for all devotees of the Supreme Personality of Godhead fall within the months of August and September. The first (August 11) is Janmastami, the unique day commemorating Krishna’s appearance on earth five thousand years ago. The next day, Vyasa-puja (August 12), celebrates the appearance anniversary of our beloved spiritual master, His Divine Grace A.C. Bhaktivedanta Swami Prabhupada. Finally, Radhastami (September 23) marks the appearance day of Srimati Radharani, Lord Krishna’s eternal companion. Janmastami is the most opulent festival day for devotees. In India it is still observed with great pomp in every Hindu house, and even the devotees of other religious groups enjoy the ceremonies of this auspicious day. Many people make a holy pilgrimage to Gokula Vrndavana, the place of Krishna’s pastimes, which is located near Delhi in India. It is said that if someone simply goes to Vrndavana, he will immediately feel separation from Krishna, who performed such nice activities when He was present there. Srila Prabhupada’s disciples have arranged for the construction of an opulent Krishna consciousness temple in Vrndavana. This temple will officially open in a joyful ceremony on this coming Janmastami. In the west, hundreds of devotees observe Janmastami by making a holy pilgrimage to New Vrndavana, a 1,000-acre Krishna conscious community in the West Virginia hill country. New Vrndavana is so named because it is the western counterpart of India’s Vrndavana. Great authorities on spiritual science state that the area known as Gokula Vrndavana, where Krishna performed His pastimes on earth, is as good as Goloka Vrndavana, Krishna’s eternal abode in the spiritual sky. Poor human understanding cannot possibly determine how Goloka Vrndavana in the spiritual world, far beyond human comprehension, can be nondifferent from actual geographical places in India and West Virginia. Yet Vrndavana and New Vrndavana, although on earth, are on the spiritual plane; their positions in material space and time in no way restrict their eternal transcendental nature. For the pleasure of the Lord, New Vrndavana has contented, milk-giving cows (now numbering more than two hundred), acres of rolling green pasturing grounds, and vast tracts of farmland where devotees raise a wide variety of crops. 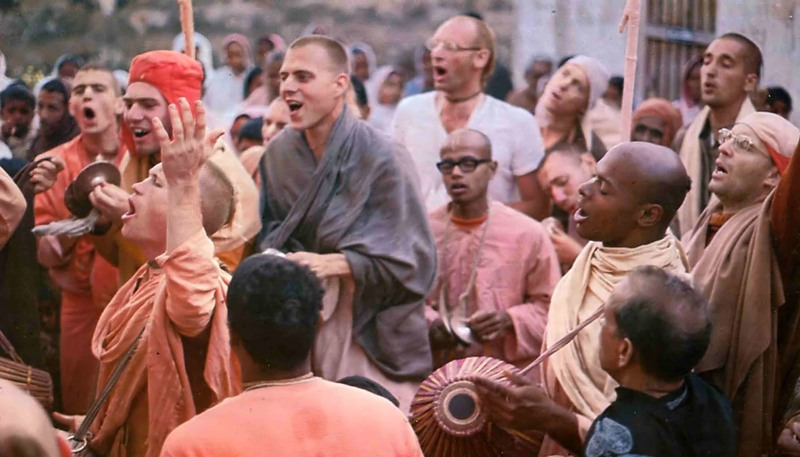 Thus all the necessities of life are easily provided, and the residents of New Vrndavana find that the combination of simple rural living and Krishna consciousness makes their lives complete and fulfilling. Devotees in New Vrndavana are now constructing seven temples, modeled after the seven major temples in Vrndavana, India. Soon, therefore, no one in New Vrndavana will ever be beyond the sound of temple bells, reminding everyone of Krishna’s all-attractive presence. During the New Vrndavana festival Sudama Maharaja (center, with saffron staff), one of Srila Prabhupada’s disciples in the renounced order of sannyasa, preaches the glories of the Lord to the assembled devotees. During the week of Janmastami, devotees from all over North America flock to this beautiful land for many days of festivities to glorify the Supreme Personality of Godhead. Simply hearing about the transcendental activities of the Lord in the association of pure-hearted devotees brings feelings of transcendental bliss. In fact, the first symptom of one who has actually come to the spiritual platform is that he is always joyful. This joyous life is attained as a reaction to reading Bhagavad-gita and Srimad-Bhagavatam or associating with people interested in the spiritual life of Krishna consciousness, especially those who are seriously determined to achieve the favor of Krishna. 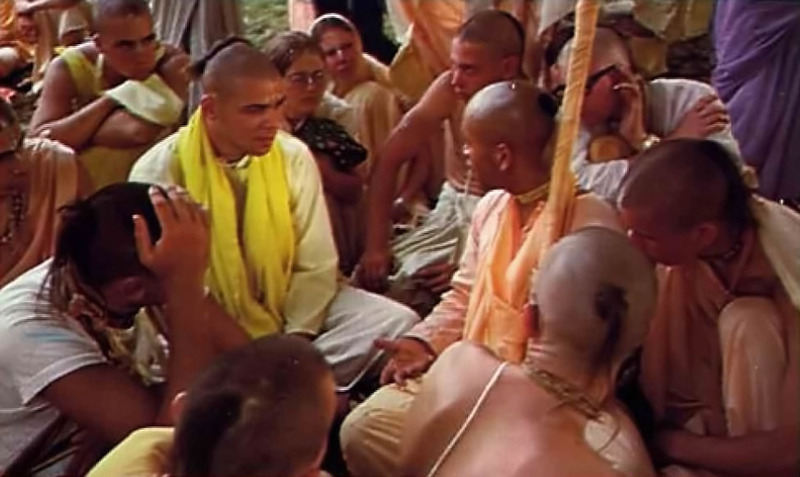 Srila Prabhupada allows his most advanced disciples in Krishna consciousness to accept the renounced order of life and engage themselves full time in preaching Krishna consciousness (opposite, below). In this order, called sannyasa, the devotee breaks his connection with wife and family and fully surrenders his life to the Lord’s service. The thoughts of such pure devotees dwell in Krishna, and they derive great satisfaction and bliss enlightening one another and conversing about Him. By the grace of the Lord these fully dedicated sannyasis are able to abandon all material desires born of false ego and thus become fully self-satisfied. The association of other devotees, especially such elevated sannyasis, generates spontaneous feelings of happiness within the minds of the devotees who come together at New Vrndavana for the many days of festivities. There is ecstatic singing (above), dancing and philosophical discussion throughout the days and nights. For the entire week of Janmastami, the chanting of Hare Krishna goes on literally twenty-four hours a day. The appearances of the Lord, his pure devotee and his pleasure potency are occasions for especially ecstatic singing and dancing. In India, as in the rest of the world, national and sectarian limitations become irrelevant in a flood of love of Krishna. After arati most of the disciples continue their japa (soft chanting of the maha-mantra), while others bathe and dress the Deities of Radha and Krishna. According to revealed scriptures, since God is unlimited and absolute, there is no difference between the Lord and the Lord’s form and name. Therefore the Deity, or form of Krishna, is God Himself, but this fact is visible only to His devotees. To honor Krishna on the day of His birth, devotees offer their services to the Deities by dressing Them in new garments made especially for the occasion and lavishly decorating the Lord’s altar with flowers to create a nice transcendental atmosphere so ^that everyone naturally becomes absorbed in thoughts of Krishna’s transcendental appearance in this world. In observance of the great day of Janmastami itself, no one takes any food or water until midnight, when, after a majestic bathing and arati ceremony, a little prasada (the Lord’s mercy in the form of food) is distributed to everyone. The day after Krishna’s appearance day is Vyasa-puja, the appearance day of the spiritual master of the universe (jagad-guru], His Divine Grace A.C. Bhaktivedanta Swami Prabhupada. Although bogus yogis often claim the title jagad-guru to increase their false prestige, we properly honor Srila Prabhupada with this title because he is a bona fide representative of Lord Krishna, the supreme spiritual master, and is making Krishna’s message known all over the world. The morning’s activities culminate in an arati offered simultaneously to the Deities and to Srila Prabhupada. The spiritual master is not God, but he is God’s pure representative. Therefore, on account of his being the most confidential servitor of the Lord, he is honored as much as the Supreme Lord Himself. After the drati ceremony, all the devotees partake of a sumptous feast of Krishna prasada to their full satisfaction. The third festival, Radhastami, the appearance day of Srimati Radharani, occurs on September 23. Srimati Radharani personifies Krishna’s internal energy, or pleasure potency. She is described as the symbol of devotional service in the highest degree, and She is known throughout the world as the most beloved of Krishna. Her name is always associated with Krishna, for devotees speak of “Radha-Krishna.” Radharani is always prepared to fulfill all the desires of Sri Krishna, She is the supply source of all the demands of Sri Krishna, and She is qualified with uncommon qualities for the satisfaction of Krishna. Radhastami is a special opportunity to glorify Srimati Radharani, under whose care one can attain perfection in devotional service. Many thousands and millions of living entities are wandering within this material world, and some of them, by the grace of Lord Krishna and the spiritual master, can get the seed of devotional service. One must sow this seed in the field of the heart, just as a gardener sows the seed of a valuable tree. Periodic occasions for remembering the Lord and His pure devotees, such as Janmastami, Vyasa-puja, and Radhastami, stimulate ecstatic love of Krishna. Joining in these activities is just like pouring water on the creeper of devotion. As one hears and chants the holy name of the Supreme Lord or takes part in discussions of devotional service in a society of pure devotees, the plant of devotional service sprouts from the seed of devotion and begins to grow freely. When fully grown, it transcends the length and breadth of the universe and enters the effulgence that pervades the spiritual world. The plant penetrates even this effulgence and then gradually enters the planet known as Goloka Vrndavana, where it takes shelter at the lotus feet of Krishna. After attaining this position, the plant produces the fruit known as love of Godhead. That is the ultimate goal of devotional service and the perfection of human life. Therefore devotees take advantage of these festive days to glorify Their Lordships Sri Sri Radha and Krishna, and Their pure devotee, Srila Prabhupada. 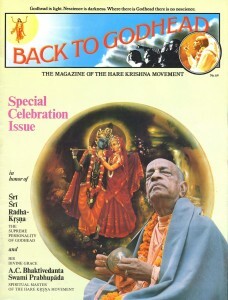 Visakha-devi dasi, a graduate of Rochester Institute of Technology, is a professional photographer who joined ISKCON in 1971. She is now traveling around the world making documentary films about the Krishna consciousness movement. 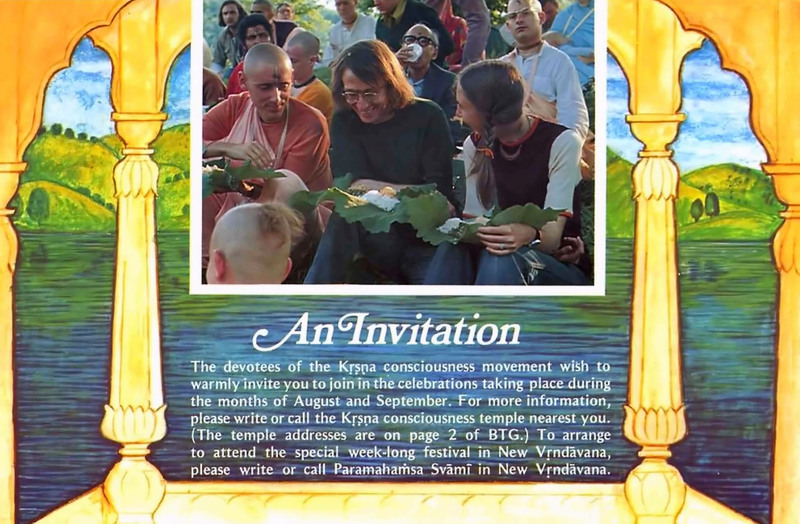 The devotees of the Krishna consciousness movement wish to warmly invite you to join in the celebrations taking place during the months of August and September. For more information, please write or call the Krishna consciousness temple nearest you. (The temple addresses are on page 2 of BTG.) To arrange to attend the special week-long festival in New Vrndavana, please write or call Paramahamsa Svami in New Vrndavana.